ASC was founded in Tokyo sometime around 1950 in what was then classed as occupied Japan. Its trademark / logo had the letters of its company name ASC within a diamond. ASC produced a range of tinplate / mechanical toy vehicles, space toys, many of which were to become highly collectable as were several of their classic robot figures, along with many tinplate novelty items all marked with the ASC logo. Early post war clockwork items normally operated by means of a permanent key before, like many of its competitors, there was a move to battery operated toys which would allow for multi-action features. The history of ASC mirrored that of many Japanese tinplate toy companies which saw a continued healthy growth from a birth in the early years following the end of WWII when the demand for inexpensive toys was high and continued to grow year on year. However the company was struggling in its traditional marketplace by the 1970′s, switching instead to creating portrayals of animated and live-action heroes. Large scale friction drive tinplate model. Yellow bodywork finish with orange trim, Nippon Taxi livery, roof sign, plated parts and detailed tinprinted interior c1970. 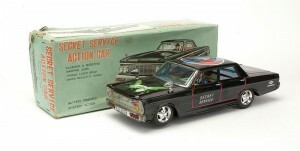 The ‘Green Hornet’ secret service action car from ASC, tinplate battery operated model in black colourway with plated parts. Green Hornet decal to the bonnet, secret service lettering to doors and boot and secret agent figure to roof. Lithographed interior with driver figure. Mystery action with flashing and bursting machine guns and laser beam, realistic sound, c1960. 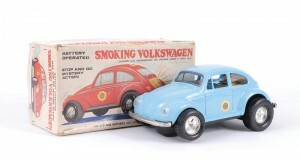 Large scale tinplate battery operated Volkswagen Beetle model with detailed tinprinted interior. Produced in various colourways, light blue, orange, red etc with plated parts. ‘Stop and Go’ mystery action, lighted engine compartment and smoke emitting exhaust, 27cm. 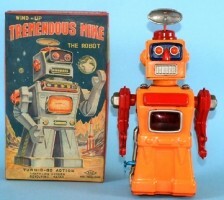 This is a very rare and classic robot from the early 1950′s. Made of tinplate with clockwork mechanism the robot came in just two colourway versions - orange/red and grey/red. Skirted robot will change direction – ‘turn and go’ action, has sparks in his chest and rotating antenna.